America is a five, in a world where your status defines your life. In the new country of Illéa, citizens are born into their caste, from those classified as One, the elite, to the homeless struggling to survive, the Eights. You must marry within your caste, with only men being permitted to marry beneath them. Your status determines how citizens will earn their living. America is a performer, her family being patrons of the arts. They have enough to get by... Barely. Aspen is a six, and is born into servitude. He is beneath America, making their romantic interludes both illegal and dangerous. When the invitation for the Selection is announced by the palace, Aspen doesn't want America to always wonder what could have been. Being one of the selected girls chosen to potentially become the wife of prince Maxon, the future princess of Illéa. When America is chosen to move to the palace along with the other 35 selected girls, she leaves with a heavy and broken heart. If it weren't for the promised compensation for her family, she never would have agreed to enter. America is a down to earth, stubborn and of simple taste, vowing to be none other than her true self. She quickly cements herself as one of the favorites to become the princess of Illéa, with her honesty and humanity. As Maxon and America strike up a warm and strangely comfortable friendship, the competition intensifies. Girls are being sent home, which pales I'm comparison when rebels are trying to storm the castle. The rebel fighters are sweeping the country, hiring towns and clearing crops, but why? As Maxon and America's friendship blooms into something more amidst the growing concern, a new soldier is recruited to the palace duties, and American wonders if her time as one of the selected has come to an end. 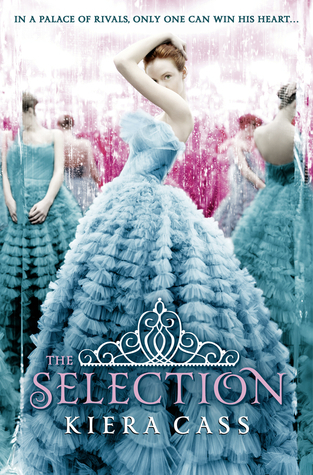 The Selection is an entertaining version of The Bachelor, with a little dystopian woven throughout. Illéa, formally The United States of America, was invaded after the forth world war, effectively becoming The United States of China, when America failed to repay it's national debt. Illéa was taken back by the citizens and a monarchy came to be. But this aspect of the storyline, takes a backseat to the Selection contest and love triangle. I was waiting for 'The Rebels' to make a grand statement, but sadly it never came. It was entertaining, but really more of a teen romance than the post apocalyptic dystopian that it's shelved at on Goodreads.